This article is about the entertainer. For other people named Mary Martin, see Mary Martin (disambiguation). Mary Virginia Martin (December 1, 1913 – November 3, 1990) was an American actress, singer, and Broadway star. A muse of Rodgers and Hammerstein, she originated many leading roles over her career including Nellie Forbush in South Pacific and Maria von Trapp in The Sound of Music. She was named a Kennedy Center Honoree in 1989. She was the mother of actor Larry Hagman. Martin was born in Weatherford, Texas. Her life as a child as she describes it in her autobiography My Heart Belongs was secure and happy. She had close relationships with both her mother and father as well as her siblings. Her autobiography details how the young actress had an instinctive ear for recreating musical sounds. Martin's father, Preston Martin, was a lawyer, and her mother, Juanita Presley, was a violin teacher. Although the doctors told Juanita that she would risk her life if she attempted to have another baby, she was determined to have a boy. Instead, she had Mary, who became quite a tomboy. During high school, Martin dated Benjamin Hagman before she left to attend finishing school at Ward–Belmont in Nashville, Tennessee. During that time, she enjoyed imitating Fanny Brice at singing gigs, but she found school dull and felt confined by its strict rules. She was homesick for Weatherford, her family and Hagman. During a visit, Mary and Benjamin persuaded Mary's mother to allow them to marry. They did, and by the age of 17, Martin was legally married, pregnant with her first child (Larry Hagman) and forced to leave Ward–Belmont. She was, however, happy to begin her new life, but she soon learned that this life as she would later say was nothing but "role playing" (p. 39). Wanting to learn more moves, Martin went to California to attend the dance school at the Franchon and Marco School of the Theatre and opened her own dance studio in Mineral Wells, Texas. She was given a ballroom studio with the premise that she would sing in the lobby every Saturday. There, she learned how to sing into a microphone and how to phrase blues songs. One day at work, she accidentally walked into the wrong room where auditions were being held. They asked her in what key she would like to sing "So Red Rose". Having absolutely no idea what her key was, she sang regardless and got the job. She was hired to sing "So Red Rose" at the Fox Theater in San Francisco followed by the Paramount Theater in Los Angeles. There would be one catch—she had to sing in the wings. She scored her first professional gig unaware that she would soon be center stage. Soon after, Martin learned that her studio had been burnt down by a man who thought that dancing was a sin. She began to express her unhappiness. Her father gave her advice saying that she was too young to be married. Martin left everything behind including her young son, Larry, and went to Hollywood while her father handled the divorce for her. In Hollywood, Martin plunged herself into auditions—so many that she became known as "Audition Mary". Her first professional audition and job was on a national radio network. Among Martin's first auditions in Hollywood, she sang, "Indian Love Call". After her singing the song, "a tall, craggly man who looked like a mountain" told Martin that he thought she had something special. It was Oscar Hammerstein II (pp. 58–59). This marked the start of her career. Martin began her radio career in 1939 as the vocalist on a short-lived revival of The Tuesday Night Party on CBS. In 1940, she was a singer on NBC's Good News of 1940, which was renamed Maxwell House Coffee Time during that year. In 1942, she joined the cast of Kraft Music Hall on NBC, replacing Connie Boswell. She was also one of the stars of Stage Door Canteen on CBS, 1942–1945. Martin struggled for nearly two years to break into show business. As a struggling young actress, Martin endured humorous and sometimes frightful luck trying to make it in the world, from car crashes leading to vocal instruction, unknowingly singing in front of Oscar Hammerstein II, to her final break on Broadway granted by the very prominent producer Lawrence Schwab. Using her maiden name, Martin began pursuing a performing career singing on radio in Dallas and in nightclubs in Los Angeles. Her performance at one club impressed a theatrical producer, and he cast her in a play in New York, but that production did not open. She was then cast in Cole Porter's Leave It to Me!, making her Broadway debut in November 1938 in that production. She became popular on Broadway and received attention in the national media singing "My Heart Belongs to Daddy". With that one song in the second act, she became a star 'overnight'. Martin reprised the song in Night and Day, a Hollywood film about Cole Porter, in which she played herself auditioning for Porter (Cary Grant). "My Heart Belongs to Daddy" catapulted her career and became very special to Martin—she even sang it to her ailing father in his hospital bed while he was in a coma. Martin did not learn immediately that her father had died. Headlines read "Daddy Girl Sings About Daddy as Daddy Dies". Because of the show’s demanding schedule, Martin was unable to attend her father’s funeral. In 1943 she starred in the new Kurt Weill musical One Touch of Venus and then Lute Song in 1946. She auditioned for the lead in Porter's Kiss Me, Kate but chose to star in another show instead that opened three months after, South Pacific. As nurse Nellie Forbush, Martin opened on Broadway in South Pacific on April 7, 1949. Her performance was called "memorable...funny and poignant in turns", and she earned a Tony Award. Richard Watts Jr. of the New York Post wrote: "nothing I have ever seen her do prepared me for the loveliness, humor, gift for joyous characterization, and sheer lovableness of her portrayal of Nellie Forbush.... Hers is a completely irresistible performance." She opened in the West End production on November 1, 1951. Her next major success was in the role of Peter in the Broadway production of Peter Pan in October 1954 with Martin winning the Tony Award. Martin opened on Broadway in The Sound of Music as Maria on November 16, 1959, and stayed in the show until October 1961. She won the Tony Award for Best Actress in a Musical. The musical gave Martin "the chance to display her homespun charm." In 1966, she appeared on Broadway in the two-person musical I Do! I Do! with Robert Preston and was nominated for the Tony Award (Leading Actress in a Musical). A national tour with Preston began in March 1968 but was cancelled early due to Martin's illness. Although she appeared in nine films between 1938 and 1943, she was generally passed over for the filmed version of the musical plays. She herself once explained that she did not enjoy making films because she did not have the connection with an audience that she had in live performances. The closest that she ever came to preserving her stage performances was her famous television appearances as Peter Pan. The Broadway production from 1954 was subsequently performed on NBC television in RCA's compatible color in 1955, 1956, and 1960. Martin also preserved her 1957 stage performance as Annie Oakley in Annie Get Your Gun when NBC television broadcast the production live that year. While Martin did not enjoy making films, she apparently did enjoy appearing on television as she did frequently. Her last feature film appearance was a cameo as herself in MGM's Main Street to Broadway in 1953. Martin made an appearance in 1980 in a Royal Variety Performance in London performing "Honeybun" from South Pacific. Martin appeared in the play Legends with Carol Channing in a one-year US national tour opening in Dallas on January 9, 1986. Star for Recording on the Hollywood Walk of Fame at 1560 Vine Street, Hollywood: She also has one for Radio at 6609 Hollywood Blvd. Martin was inducted into the American Theater Hall of Fame in 1973. She received the Kennedy Center Honors, an annual honor for career achievements, in 1989. She received the Donaldson Award in 1943 for One Touch of Venus. A special Tony was presented to her in 1948 while she appeared in the national touring company of Annie Get Your Gun for "spreading theatre to the rest of the country while the originals perform in New York." In 1955 and 1956, she received, first, a Tony Award for Peter Pan, and then an Emmy for appearing in the same role on television. She also received Tonys for South Pacific and in 1959 for The Sound of Music. After Martin's divorce from Benjamin Hagman, she married Richard Halliday, who was eight years her senior. Early in their marriage, he worked as a drama critic for the New York World-Telegram and a movie critic for the New York Daily News. Eventually, Halliday became producer or co-producer of at least two of his wife's projects. In the early 1970s, the couple lived, according to his 1973 obituary in the Connecticut Sunday Herald, "on a vast ranch they own near Anápolis" in the state of Goiás, Brazil. The ranch was called "Nossa Fazenda Halliday" (our Halliday Farm). Martin was called "Dona Maria" by neighbors in the vicinity of the Brazilian ranch. She and Halliday had a great love for that land. A project of restoration by local Intuitute Jan Magalinski is transforming the farm into the Cinema Museum of Goias. People whose memories would be preserved by the museum include actress Janet Gaynor and her husband, Adrian and actors Cary Grant and Claudette Colbert. They were interested in the landscape of Anapolis. Cultural scholar Lillian Faderman has written that Martin and actress Janet Gaynor often traveled together along with Martin's husband Halliday and with Gaynor's husband. On the evening of September 5, 1982, Mary Martin, Janet Gaynor, Gaynor’s husband Paul Gregory, and Martin's manager Ben Washer were involved in a serious car accident in San Francisco. A van ran a red light at the corner of California and Franklin Streets and crashed into the Luxor taxicab in which the group was riding, knocking it into a tree..Ben Washer was killed, Mary Martin sustained two broken ribs and a broken pelvis, and Gaynor's husband suffered two broken legs. Gaynor sustained several serious injuries. The driver of the van, Robert Cato, was arrested on two counts of felony drunk driving, reckless driving, speeding, running a red light, and vehicular homicide. On March 15, 1983, he was found guilty of drunk driving and vehicular homicide and was sentenced to three years in prison. Janet Gaynor, died two years later from complications from her injuries. Martin died four weeks before her 77th birthday of cancer at her home in Rancho Mirage, California, on November 3, 1990. She is buried in City Greenwood Cemetery in Weatherford, Texas. Fashion Horizons (1940, Short subject) - Herself, Co-Starred in Paramount's "Love Thy Neighbor"
^ "GenealogyMagazine.com - larryhagman". genealogymagazine.com. ^ a b Dunning, John. (1998). On the Air: The Encyclopedia of Old-Time Radio. Oxford University Press. ISBN 978-0-19-507678-3. Pp. 287, 633, 684. ^ "Program Reviews: 'Kraft Music Hall'" (PDF). Billboard. 54 (2). January 10, 1942. p. 8. Retrieved 15 July 2017. ^ Block, Geoffrey (1997). Enchanted Evenings. Oxford University Press. p. 180. ISBN 978-0195167306. ^ "Mary Martin". Famoustexans.com. Retrieved 2012-04-27. ^ Crowther, Bosley. "Movies: About Main Street to Broadway". The New York Times. Retrieved May 12, 2010. ^ "15 Inducted into Theater Hall of Fame". The Blade. Toledo. January 17, 1974. ^ "Richard Halliday Dead at 67". Connecticut Sunday Herald. March 4, 1973. Retrieved 2016-04-22. ^ Faderman, Lillian and Stuart Timmons (2006). Gay L.A.: A History of Sexual Outlaws, Power Politics, and Lipstick Lesbians. New York: Basic Books. p. 55. ISBN 978-0465022885. Retrieved 20 March 2015. ^ "Hospitalized". Time. September 20, 1982. Retrieved 2008-06-25. Janet Gaynor, 73, winner of the first Oscar for Best Actress (1929), in serious condition with eleven broken ribs, a fractured collarbone, pelvic fractures, an injured bladder and a damaged kidney; and Mary Martin, 68, star of Broadway's original South Pacific and TV's first Peter Pan, in good condition with two fractured ribs, a fractured pelvis and a punctured lung; after a vehicular accident; in San Francisco. Gaynor and her husband Paul Gregory, 61, and Martin and her press agent, Ben Washer, 76, were riding in a taxi when they were struck broadside by a van. Washer was killed. Gregory is in good condition. ^ Carter, E. Graydon (October 18, 1982). "People: Milestones". Time. Retrieved 2008-06-25. Just nine days after the cab she was riding in was hit broadside by a van, Mary Martin, 68, with a plucky smile and the help of a walker, left San Francisco General Hospital. ^ Gussow, Mel. "Mary Martin, 76, First Lady of Musicals, Dies". Mary Martin, America's favorite leading lady of musical comedy, as Ens. 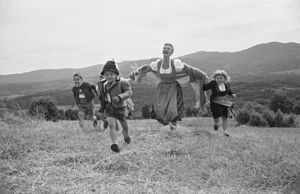 Nellie Forbush in "South Pacific," Maria von Trapp in "The Sound of Music" or the title role in "Peter Pan," died Saturday afternoon at her home in Rancho Mirage, Calif. She was 76 years old. ^ "Milestones". Time. November 5, 1990. Retrieved 2008-06-25. ^ "Air Ya Listenin?". The Mason City Globe-Gazette. May 14, 1943. p. 2. Retrieved July 21, 2015 – via Newspapers.com. Martin, Mary (1969). Mary Martin's Needlepoint. Galahad Books. ISBN 978-0883650929. Martin, Mary (1976). My Heart Belongs. New York: Morrow. ISBN 0-688-03009-2. Kaufman, David (2016). Some Enchanted Evenings: The Glittering Life and Times of Mary Martin. New York: St. Martin's Press. ISBN 978-1-250-03175-4. Wikimedia Commons has media related to Mary Martin.